I had a go at making some more balled snacks. packed with nuts, dried fruit, coconut and some raw cacao powder… because chocolate is awesome – and raw cacao is even more so! It contains a MASS of antioxidants and magnesium – great for an after/before gym snack. Make sure you try and use dried fruit that wasn’t preserved with sulphur dioxide – especially if you are an allergy sensitive person or asthmatic. If you do suffer from allergies or asthma?- read into sulphites and their reported effects on some people. You may be surprised to find out the amount of food that actually contains them. 1. Place all ingredients, except the water and desiccated coconut, into a food processor. Pulse around 30 seconds, until everything starts to bind together. Add a tbs of water at a time – you want the mixture to start and form a big lump – moist enough to cling together but not too moist that it is soggy. 2. 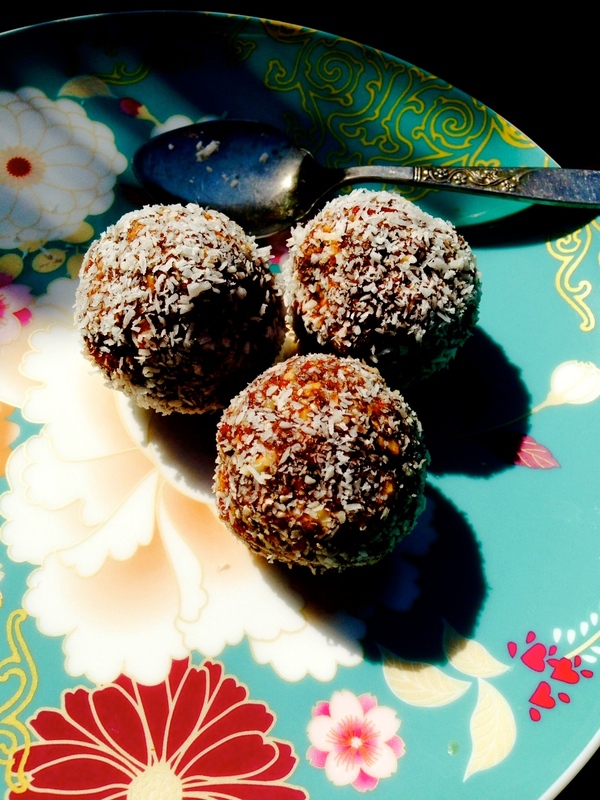 Take 1 heaped tbs at a time of mixture and roll with wet hands into a ball – then roll in desiccated coconut. Place on plate and put in fridge, once all rolled, to set for 30 minutes. 3. Store in a glass jar in fridge – or in freezer.